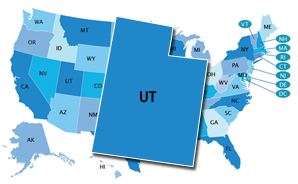 Utah state policy allows students to earn dual credit for academic or CTE postsecondary courses taken at their high school, a postsecondary institution, or virtually. Public postsecondary institutions in the state are required to accept dual-enrollment credits (ECS, 2015). The Utah Partnership for Education, Inc., established one Early College High School program and the Utah Partnership Foundation established two programs, each in partnership with an institution of higher education in Utah, as part of the Early College High School Initiative (ECHSI). More information about schools participating in ECHSI is available at the ECHSI website (Jobs for the Future, n.d.). Utah "organizes secondary CTE programs into eight "CTE Pathways" based on state workforce requirements, and they are framed around the National Career Cluster Framework" (NASDCTEc, n.d.).The Career Clusters were chosen based on the likelihood that completion of a program of study within a cluster would prepare students for postsecondary education and employment within existing and/or emerging professions (Utah State Office of Education, 2008). In Utah, individual student planning consists of school counselors coordinating ongoing systemic activities designed to help individual students establish personal goals and develop future plans. Utah's Student Education Plan (SEP) and Student Education Occupation Plan (SEOP) are in use but not mandated by the state. They include all students in Grades K–12. Districts may set requirements beyond the statewide minimum graduation requirements. Utah provides resources for a model called Check & Connect, a comprehensive tier 2 intervention designed to engage family, student, and school staff in supporting engagement and learning for students in Grades K–12. The level at which Early Warning System data are reported and who can access the data is not publicly available.